TheNorth Pole of Earth is quite famous for their snow-filled climes and also for hosting a workshop related to Santa. Now, certain pictures from Mars reveal that Earth is not the only planet with scenes ofsnow during this holiday season. The European Space Agency’s MarsExpress mission managed to capture the Korolev crater that lies closeto the North Pole of Mars. The crater lies 82 km across and is filledup with ice, which has a thickness of 1.8km. Korolev crater got itsname after rocket engineer and spacecraft designer Sergei Korolev,who is the architect of the space programme of the Soviet Union. MrSergei Korolev had even worked on the first ever interplanetarymissions to the Moon, Mars and Venus. The Sputnik Programme was alsoincluded, which managed to launch the first artificial satellite inthe world. The pictures of the crater are basically the composites made up of snaps, which were taken by the Mars Express Resolution Stereo Camera. It even features the topographic views, which portray the full circular depression on the surface of the planet. 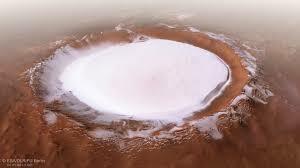 The ESA even explained that it is a very well preserved example of a Martian crater, which is filled up not with snow but ice. They said that this icy presence is because of an interesting phenomenon is known as a ‘cold trap’, which occurs just how the name suggests. The Mars Express mission happens to be the first venture for ESA to some other planet. The major part of the Red Planet is filled with sand, which typically fills up the air with plumes of red dust but there is an existence of ice near their poles. Back in the September 2012, NASA had first discovered a stream that once ran right across the planet. The scientists had previously found certain examples, which suggested that there was the presence of water on the planet. In a blog post on the website of NASA, it was mentioned that plenty of papers have been written related to the channels on Mars with a number of hypotheses related to the flows in them. It even said that this is the first time, they have actually noticed gravel on Mars, which is water-transported.